This week the Featured section of the iPad App Store is full of even more highlighted app collections than usual. 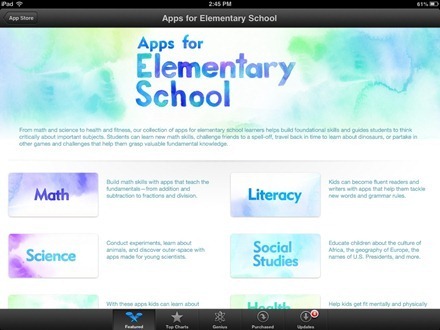 One of the notable app collections that caught my eye is ‘Apps for Elementary School’ – as I have a daughter in 4th grade. The collection covers a lot of ground. It includes around 275 apps divided into these main sections: Math, Literacy, Science, Social Studies, Art & Music, and Health & Fitness. Each of those main sections has useful sub-sections to make it easier for specific apps that you or your elementary school age kids may be interested in. For example, the Math section has sub-sections for Measurement & Data, Shapes & Spatial Reasoning, The Number System, Drill & Practice, Beyond Drill – Strategy, and Beyond Drill – Brain Busters; and the Social Studies section has sub-sections for World Cultures, Geography, and History & Historical Figures. I’ve spent a good amount of time browsing the collection and I’m still far from done – but I’ve already seen some of my daughter’s favorites and quite a few promising apps we need to try out. You can find the Apps for Elementary School collection in the top rotating panel of the Featured tab in the iPad App Store.